This exhibition is actually the fourth opus (including Kung Fu Motion) of an endeavour bringing martial arts together in the context of a museum with digital media. This endeavour is being carried out by Professor Jeffrey Shaw (City University, Hong Kong), Professor Sarah Kenderdine (EPFL, Lausanne), and Hing Chao (International Guoshu Association). This opus focused on the connection between modern Chinese martial arts (living traditions, cultural festivals) and past martial practices in context (fight books, art, and historical contexts). 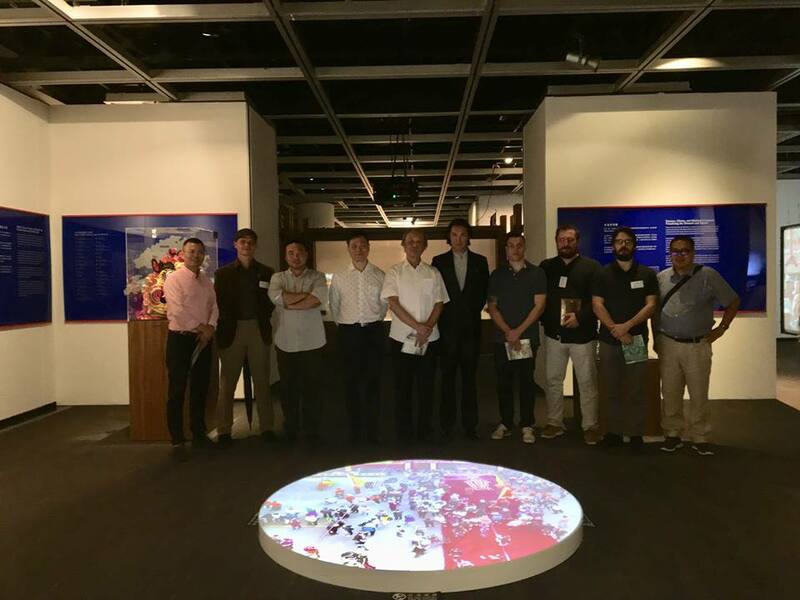 The first part of the exhibition brought the visitor into the context of the pirates’ invasions of the east and south-east Chinese coast in the sixteenth century. It was the time of the major martial arts (military) treatises of the period, the Qi Jiguang and New Book on Military Discipline (read about on the second issue of the Journal of Chinese martial studies, and I contributed a forthcoming article to the International Journal of History of Sports comparing European and Chinese Fight Books). A large scroll allows the visitors to visualise these martial arts in context, and was mirrored by a linear navigator displaying modern martial arts interpretations. The next section displayed the various processes involved with the modern interpretation of this text and detailed the involvement of the modern masters of the living tradition of Chinese martial arts. It was a very interesting section for the martial arts practitioner involved into HEMA endeavours. The following section focused on living traditions related to Chinese martial arts, including martial arts practice and their different contemporary branches (with a display of genealogies), festivals of martial arts, and the unicorn dance (with a focus on the tradition of making the masks). As in Lausanne and in the previous opuses, digital media and new technologies played a large part in the installations. There were high-resolution images from drones projected on the ground, many displays on screens of different sizes, and circular installations allowing for 360° video visualisation. The most impressive aspect (and new to me) was a 3D animation of a martial arts form illustrated with a paper-like figure taken from an original illustration. This was based on Okinawa Bubishi, an important nineteenth-century text for karate that illustrates the connection between South Chinese martial arts (Fujian) and Okinawa martial arts. Guided tour by the curator Hing Chao, during the 2nd International Martial Arts studies Conference. I had the pleasure to have a tour with one of the curators, and the crowd was full of seasoned Chinese martial artists, including masters. This was exciting for me because this event focused on the martial arts of the past, both in context and through their connection to living traditions. There is much to do in terms of collaboration between historical martial arts and their reconstruction, in both East and West. We are working on this (see my report on the 2nd international conference on martial arts studies)! Stay tuned.